A contemporary collection exploring the Seven Sacraments of the Catholic Church, with serene and inspirational songs about each of these rites that shower us with God’s blessings. 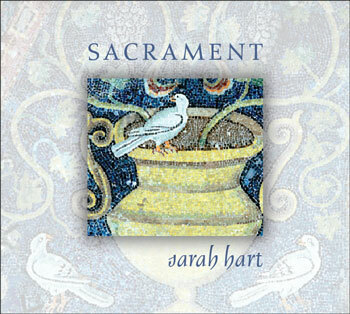 Sarah Hart, one of today’s most cherished contemporary Catholic musicians, delivers Sacrament, her 10th collection, which explores what each sacrament means for us as individuals, and as Catholics. “Gather at the Water,” about Baptism, focuses on incorporating new members, free from all sin, into the Church through a sacramental bond of unity. “Mercy on Me,” a song for Reconciliation, has a Taizé feel and a message of forgiveness and healing, which could be used at Reconciliation Services, and for inspiration during retreats or personal reflection. The Sacrament of the Eucharist, when Catholics receive Christ’s real presence in Communion, is enriched when we listen to the music and lyrics of “To Live With Him Forever.” As with the Sacrament of Confirmation, “May You Walk” strengthens our understanding of the life of faith confirmed by the gifts of the Holy Spirit. “Beloved, Arise” captures the beauty of the permanent union sealed by God between spouses during sacramental marriage; while “May You Be Known” contemplates the power and grace received by Bishops, Priests and Deacons in the Sacrament of Ordination, remembering that Jesus Christ commissioned his Apostles with the Holy Orders at the Last Supper. Inspired by the Anointing of the Sick, “Healed in Christ” praises God for the spiritual and sometimes physical healing that comes through Christ, with moving lyrics that speak to the sick, the lonely and those in urgent need of comfort. Through the Seven Sacraments we, as Catholics, are nourished and strengthened, and we express our faith. It is with the sacraments that we are also formed as a Church. The songs of Sacrament support our reflection on these acts of faith in response to Jesus’ call to become children of God.